Kimmswick, Missouri is a beautiful little river town in Jefferson County just a short distance down the Mississippi River from St. Louis. It was founded in 1859 by a German immigrant named Theodore Kimm, who was a very successful merchant in the St. Louis area. He had moved to Jefferson County in 1850, and purchased a large amount of acreage along Rock Creek, which runs from present day Imperial, around the southern edge of Kimmswick, and into the Mississippi. As the railroad was expanding and the great river itself was a vital source of commerce, Kimm’s village grew to meet the demands of increasing population and infrastructure, rising to be the second largest town in Jefferson County by 1876, and becoming a nearby addition to the industriousness of its northern neighbor St. Louis, a city that was soon to be one of the largest in the United States. Throughout the years, Kimmswick has experienced the ups and downs of any community, watching the other villages surrounding it grow larger with the advent of Interstate 55, and maintaining its quaint sensibilities with the formation of the Kimmswick Historical Society, founded in 1969. 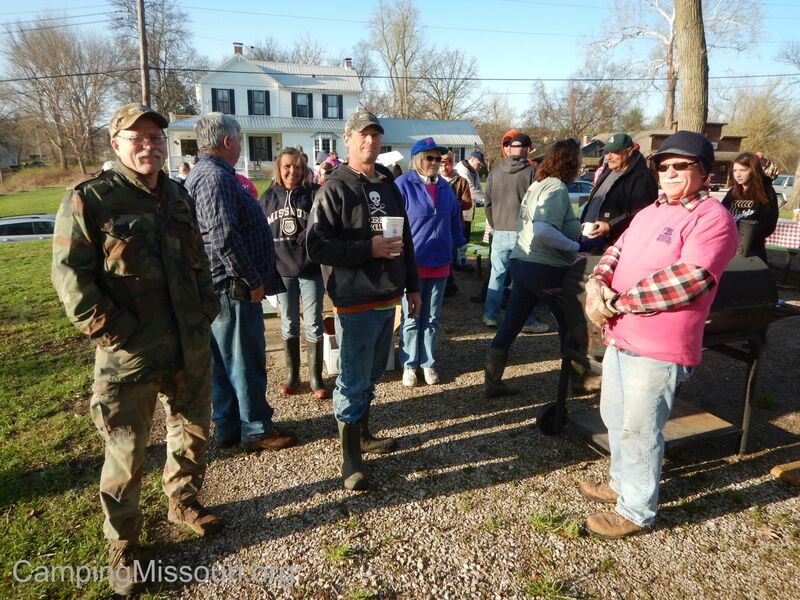 As with any river town, it has also faced its share of challenges by mother nature, regularly having to come together as a community in danger, fighting back the devastating power of the Mississippi most notably in 1993 and just a couple years ago in 2013. And then of course, usually in the month of October, Kimmswick is home to THE legendary Apple Butter Festival. With visitors from across the midwest, this is an event that anyone who appreciates the simple qualities and relaxing nature of a country lifestyle needs to experience at least once. Its popularity has justifiably grown throughout the years, so get there early to beat the rush! On this morning however, we were arriving early because we had an event of a different nature. 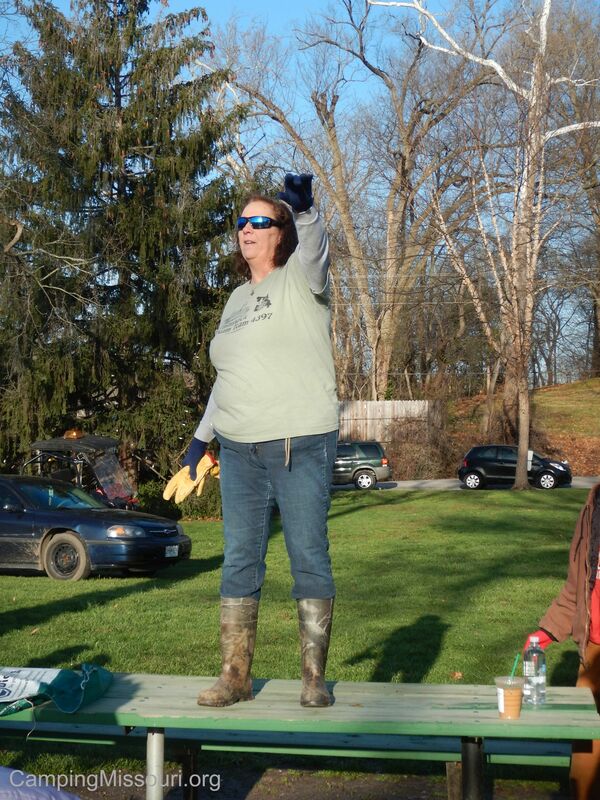 We were there to be part of the 5th Annual Kimmswick Stream Team Cleanup! Put together by the dedicated Kim Bess, leader and organizer of the Kimmswick Stream Team #4397 , this is the second time I have been to this event. 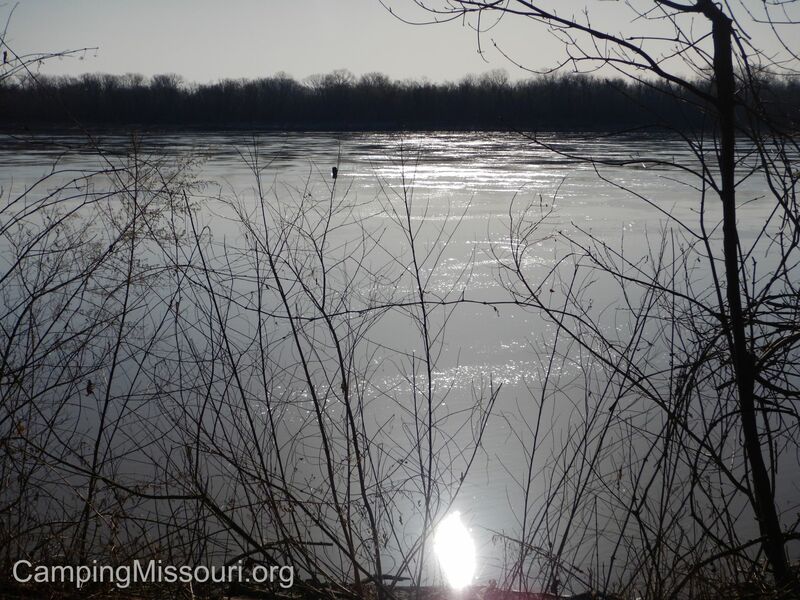 Rock Creek is a tributary of the Mississippi River that wraps around the southern edge of Kimmswick from the west, originating on the far side of Imperial, MO. If you have ever visited Mastadon State Historic Site, it is the waterway that streams past the southern side of the lower picnic area. It makes its way under Interstate 55, through Imperial, and around the little town and into the great river. Last year we had canoes in the water from up above the Route K bridge, all the way down the length of Rock Creek to the Front Street bridge, just before where it meets with the Mississippi. This year we were going to tackle the expanse of land along the Mississippi River itself, so after meeting at Jefferson Square Park at 5th Street and Beckett for some donuts and signing in, with a speech about the objectives of the day from Kim, we loaded up our bags and gloves and headed east toward the river. 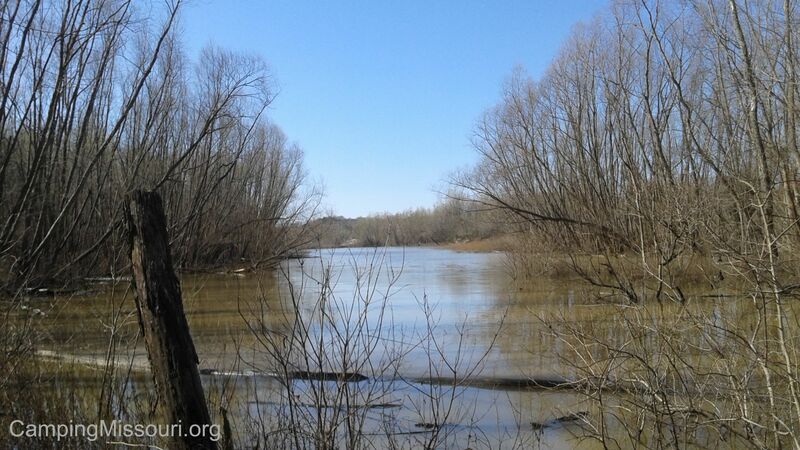 After a short drive through this pretty little town and under the bridge on the far side, we parked in an open field and walked toward the flood plain. 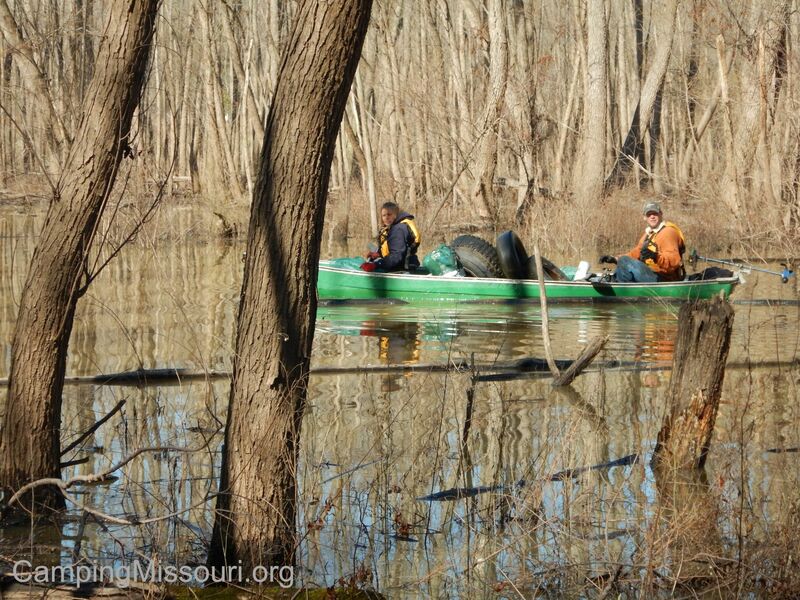 Now the area we were cleaning up today is called Chesley Island, part of the riverfront of Kimmswick. 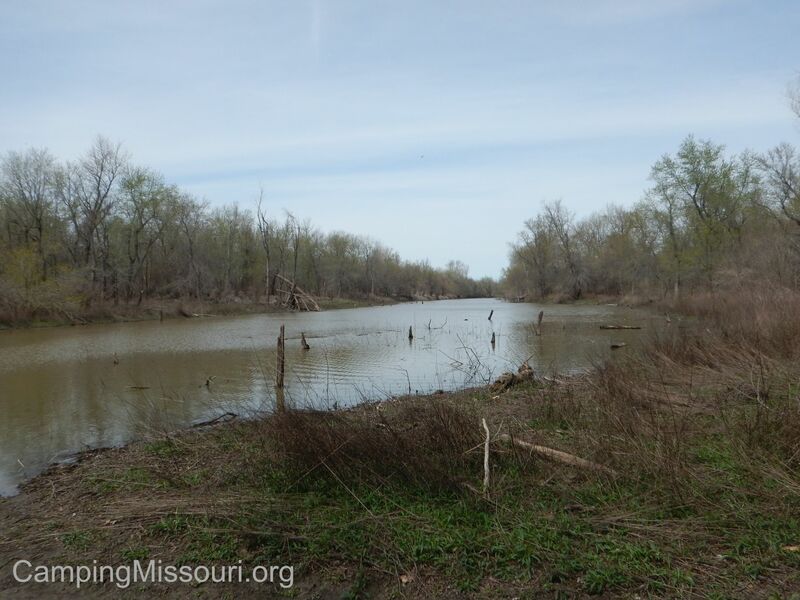 It is a strip of acreage with the Mississippi River as its eastern boundary, and bordered by a wide slough on its western edge. We moved north into the woods and began to scour the leaf litter for garbage. There was quite a bit of area, so we all spread out along a rough path, some cleaning along the river front and some of us cleaning along the edge of the slough. A group of Stream Teamers had also put canoes and kayaks into the water in the slough, and were going after some of the more stranded and unreachable tires and garbage. I made my way through the woods next to the water, picking up and stashing into my green mesh bag what garbage I found, which was all over the place thanks to the rising and falling of the river over the course of time. Ken and Christine from Stream Team #4460 were on the water in the slough, and I helped to unload their tire filled canoe each time they came to shore with their bounty. We would carry the tires over to the sloppy jeep trail running the length of the area, to be loaded onto the next available trailer being pulled along it by the ATV drivers. We were making a productive impact, as spread out as we were. Pairs of volunteers here and there off in the distance among the trees, searching the ground and water for discarded remnants of human civilization, in the worst-yet-very-positive treasure hunt ever. I eventually started working through the edge of the slough, as there was a lot of trash that had organically collected itself among the driftwood in the shallow zone just off of the bank of Chesley Island. It was an interesting experience, and I was very thankful for the hearty knee-high muck boots that I now regularly wear on these excursions. It was very much similar to that scene in the first Star Wars movie when in order to escape the guards in the prison level of the Death Star, the heroes found themselves wading in the dense floating mass of garbage in a giant trash compactor. 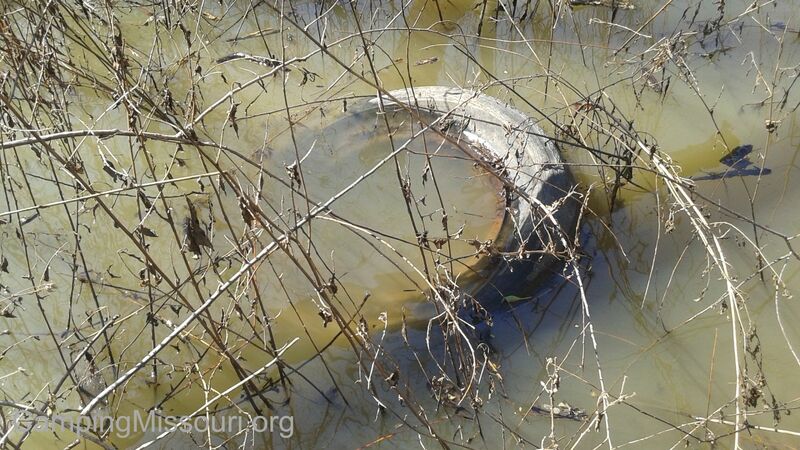 It was still a bit chilly for snakes, which I am positive dwell in this wetland area, but I kept expecting to see some sort of creature pop its head above the surface in a moment of adventurous (and somewhat anxiety inducing) surprise. Luckily for me, all that was bobbing in the water around me were bottles and jars and a tire floating on its side that had collected organic matter and had little plants growing in it. A floating flower pot, sort of. I continued along the edge of the slough, finally removing all the trash I could find up to and around an elbow in its meandered direction. It was getting close to time to stop, and there were still piles of garbage that had to be loaded up and carted out, so I made my way out of the water and toward the jeep trail and the sight of other volunteers, helping to load the trailers that were running back and forth behind ATVs through the mud and trees. 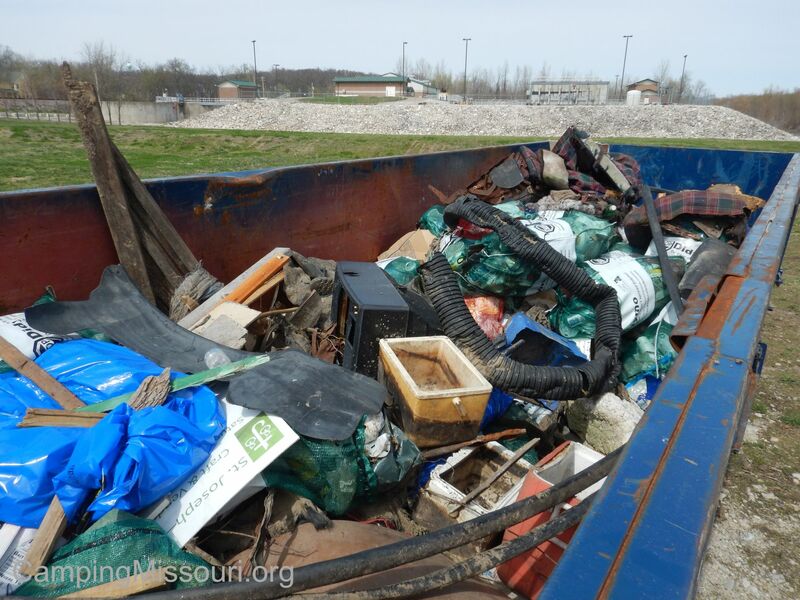 We finally got all the collected trash back to the parking area and put it all in the dumpster that was donated for this event. Then it was a short car ride back to the Jefferson Square Park to eat a couple of bratwursts and re-hydrate and socialize a bit before all us great volunteers made our way home to enjoy the rest of our Saturday. In all that day, from the volunteers on Chesley Island, on the other side of the slough, and along parts of Rock Creek, we collectively removed 35 cubic yards of trash, 1500 pounds of metal, and 131 tires (most of which still had rims), including a couple tractor tires! It was a wonderful day for sure, with the weather being perfect and getting to be out in nature next to just about the most famous river in the United States, near a beautiful little historic river town. But the best moment happened for me personally when I was out in the edge of the slough. I was just standing in the knee deep water, surrounded by bits of floating garbage here and there among all the chunks of driftwood…when everything went quiet. Not a fearful, something-bad-is-happening-in-the-woods kind of moment. This was different. Maybe I had been working hard and had finally caught my breath. Maybe it was the moment in the day when we had reached the high temperature, and everything absorbing the sunlight had opened fully for the spring air. Maybe through the chaotic randomness of water movement, a surface calm had been reached by unseen elements coming together at once. Whatever it was, a stillness occurred that immersed me in silence and life, with nothing but the air and the water and the trees around me…like the sound of looking into a mirror. This was a natural culmination of positive energy…a peaceful springtime warmth that radiated a calm and uplifting feeling. My good friend Ken said a little later, “It was like zen moment”, after I described it to him. I think he is right, and I love moments like that. A very spiritual experience in what a lot might think of as a not very spiritual place. Not a thing you can make happen, but a thing that will happen if you open yourself up to letting it occur. 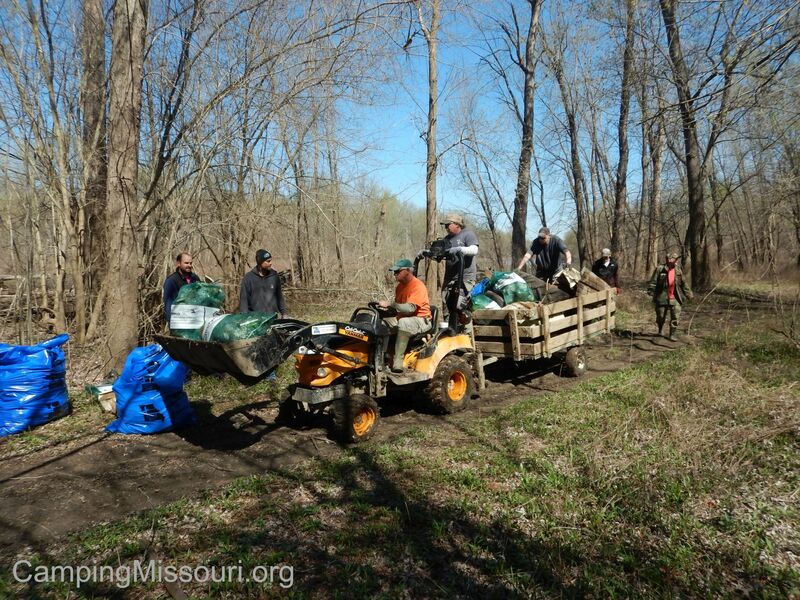 I love it when it happens while hiking a trail or sitting on an overlook, and I love that it happened in this moment along the edge of a Mississippi River slough, next to historic Kimmswick, MO, during a Stream Team cleanup on a beautiful spring Saturday. I can’t wait for the next adventure!